Coming back from their first September off in eight years, Hawthorn were one of many clubs that were hard to read in 2018, with pundits not game to tip consecutive bottom-ten finishes with master coach Alastair Clarkson at the helm. As such, the four-time premiership-winning Clarkson had his team sitting in fourth position after Round 7, but things quickly turned south when, after a three-game losing streak, Hawthorn found themselves outside of the top eight. With a favourable draw, the Hawks cruised to the end of the season, winning ten of their last 12 matches to not only return to finals action but also secure the double chance along the way. In a monster qualifying final clash, the Hawks were outclassed by Richmond before bowing out in straight sets to an in-form and confident Melbourne outfit a week later. Superstar midfielder Tom Mitchell capped off a brilliant season by not only taking out the Peter Crimmins medal from Blake Hardwick and Isaac Smith but also winning the Brownlow Medal, becoming the sixth Hawk to do so. LISTEN: Do Geelong and West Coast have the best midfields in the AFL? Brown and gold hearts were shattered in early July last year when four-time premiership Hawk and Norm Smith Medal winner Cyril Rioli announced his retirement from the game on the eve of his 29th birthday to move back home to Darwin to be closer to his family. Will Langford, the 2014 premiership hero, also decided to hang up the boots after the Hawks delisted him with one year remaining on his contract. Popular clubman Brendan Whitecross was also axed after 111 games in 11 seasons. Former No.2 draft pick Jono O’Rourke found himself without a club following his delisting, as did Kurt Heatherley, Dallas Willsmore and Kieran Lovell. Always a prominent player in trade period, Hawthorn gained talented Gold Coast youngster Jack Scrimshaw and a future fourth-round pick from the Suns in exchange for the Hawks’ future third selection. That future fourth-round pick from the Suns was then sent to the Giants, who, amid reported salary cap problems, offloaded midfield gun Tom Scully. In a blockbuster trade Hawthorn acquired Port Adelaide star Chad Wingard and the Power’s future third-round selection, but the price they had to pay was hefty, losing young gun Ryan Burton, picks 15, 35 and a future fourth-round pick from the Bulldogs acquired in a separate trade that saw Taylor Duryea sent to the Whitten Oval. Needing to boost their small forward stocks, Hawthorn then signed former Saint Darren Minchington as a delisted free agent. With two late selections in the national draft, the Hawks picked up Murray Bushrangers pair Jacob Koschitzke and Mathew Walker, upgrading rookie trio James Cousins, David Mirra and Conor Glass to the senior list. In the rookie draft Hawthorn selected Damon Greaves from East Perth, Will Golds from the Oakleigh Chargers and former GWS defender Tim Mohr. For contractual reasons Will Langford was also drafted. After spending two seasons captaining the club Jarryd Roughead made the decision to step down from the role, with a number of candidates, such as Liam Shiels, Isaac Smith and Ben Stratton, all vying for the vacant position. Hawthorn’s 2019 premiership chances took a severe hit following their return to preseason training after the Christmas break, with Tom Mitchell set to miss the entire season after suffering a badly broken leg. Mitchell, who broke the VFL/AFL record for the most disposals in a season last year, will leave a huge hole in the Hawthorn midfield, giving Clarkson and newly appointed midfield coach Sam Mitchell a major headache as they edge closer to the start of the season. Tom Mitchell was not considered for the best 22 due to a broken leg suffered at training earlier this month. 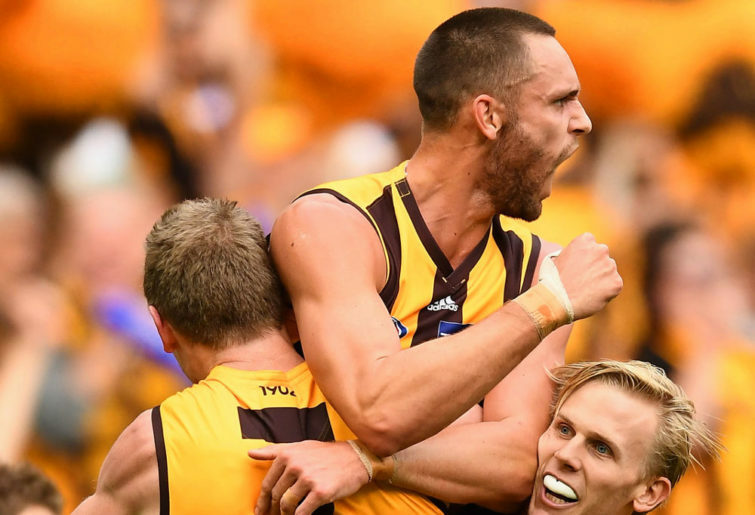 Having used Jack Gunston up the field in 2017 due to his excellent kicking, Alastair Clarkson returned the three-time premiership Hawk back to the forward line last season with great results. The former Crow became an All Australian for the first time ever after booting 51 goals and averaging 17.8 disposals as he became the Hawks’ most potent tall forward with the slow decline of the ageing Jarryd Roughead. Gunston’s 51 majors weren’t enough to secure the leading goalkicker award at the club, however, with Luke Breust taking out the honour for the first time in his career after a brilliant campaign. Breust was the premier small forward of the competition, booting 54 goals to claim his second All Australian berth. The 28-year-old will be looking to start 2019 strongly after a poor showing in last year’s finals series, where he booted just one goal from Hawthorn’s two appearances. It wasn’t long ago that Hawthorn had one of the most feared spines in the league, but now, with the aforementioned Roughead gearing up for what could be his final season and James Frawley also into his 30s, there are two particular Hawks who need to make 2019 a winner for Hawthorn to stay in the top half of the ladder. Kaiden Brand could manage just ten senior appearances in 2018, his sixth year on the list, with the tall defender struggling to make his mark in the senior outfit. Approaching the age of 25, there has been no better time for Brand to stake his claim for a long-term position in this Hawthorn backline. While many had a laugh when Hawthorn recruited Mitchell Lewis after trading out club legends Sam Mitchell and Jordan Lewis at the end of 2016, the kid with the humorous name is shaping up to be a key pillar of the Hawks’ forward line. The 198-centimetre Lewis had a productive year at VFL level, coming equal-second in the Frosty Miller Medal with 38 goals. Lewis broke through for two senior matches in which he battled hard despite not troubling the scoresheet. Extremely dedicated and one of the hardest workers on the list, watch for Lewis to be given more opportunities in 2019 as the Hawks search for their Roughead replacement. With a blonde moustache and a unique hairstyle, James Worpel was always destined for cult-hero status when he walked through the doors at Waverley Park having been drafted at pick 45 in 2017. After an early season debut, Worpel was forced to the VFL before working his way back into the seniors, exploding onto the scene with 32 possessions against Carlton in Round 18. Worpel earnt the admiration of all brown-and-gold supporters when he won a crucial one-on-one contest against Michael Hurley late in Hawthorn’s Round 20 game against Essendon, leading him to kick the match-sealing goal. A week later the 19-year-old put his body on the line in a contest with Geelong skipper Joel Selwood, with Worpel bouncing off the contact and setting up a goal to Jack Gunston. After a disappointing finals campaign, Worpel has a massive opportunity to make a midfield position his own with the season-ending injury to Tom Mitchell. As he enters the final year of his current contract, Tim O’Brien would be feeling the weight of the world on his shoulders after a subpar year at the AFL level in 2018. Not that the 24-year-old isn’t used to pressure, however, given he took over the famous number 23 following Lance Franklin’s departure at the end of 2013. But for O’Brien, who took massive strides forward in 2017, last year was anything but a successful season. Despite playing in Hawthorn’s first eight matches, O’Brien could manage just three goals, with all of them coming in one half of a match. From the conclusion of Round 8 O’Brien appeared just four times, with a switch to defence in the VFL not enough to spark him back into form. Entering his seventh year on the list, O’Brien is at the age where he can’t just be showing signs; he needs to be showing consistent good form. 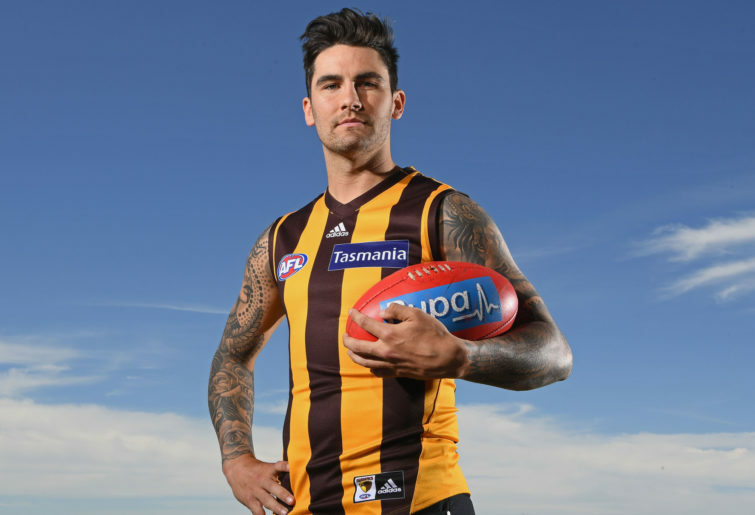 For a long time it was hard to ever imagine Chad Wingard wearing colours other than Port Adelaide’s black, teal and white, but in 2019 we’ll see the two-time All Australian wearing the brown and gold stripes after a blockbuster trade between the two clubs in the off-season. Wingard, who has played more of a midfield role in the past two seasons with the Power, is incredibly dangerous around the goals, highlighted by the 139 goals he booted between 2013 and 2015. Whether Wingard will be used up forward or in the midfield remains to be seen, but with Tom Mitchell’s injury set to deplete the Hawks’ centre bounce rotations, don’t be surprised to see the silky South Australian at the feet of Ben McEvoy and Jonathon Ceglar. Another midfield addition for the Hawks in 2019 comes in the form of Tom Scully. With the Giants facing a tight salary-cap squeeze, they were forced to offload Scully, who played 121 games for the club after making the widely criticised move from Melbourne. One of the best runners in the competition, Hawthorn will have to be patient with Scully, who suffered a sickening broken ankle in Round 2 last season, with some fearing that the former No.1 draft pick won’t be able to get back to his peak. One of many to walk out of the doors at the Gold Coast Suns, Jack Scrimshaw arrives at the Hawks with just four games to his name since being selected at pick 7 in the 2016 national draft. At 193 centimetres tall, Scrimshaw is a tall half back flanker who can cut off opposition attacks with his intercept marking. With Grant Birchall coming to the end of his decorated career, it appears Hawthorn have the perfect replacement for him. The final new Hawk acquired from an opposition club is ex-St Kilda goalsneak Darren Minchington, who Hawthorn signed as a delisted free agent. Having featured in just 28 games in seven years on the Saints’ list, Minchington will be hoping a fresh start at the Hawks can ignite his fledgling AFL career. Having earnt a debut in the final game of the home-and-away season in his first year on the list, Harry Morrison made every post a winner in 2018, missing just one match after he broke into the senior line-up in Round 3. 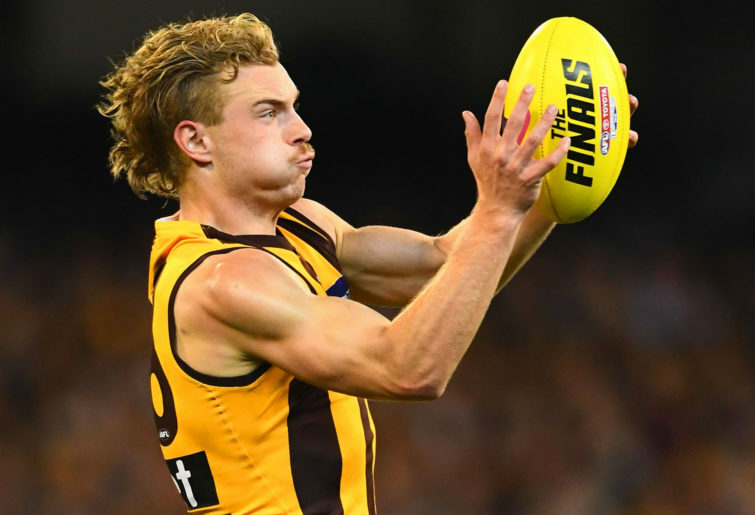 The smooth-moving youngster, who shows composure beyond his years, is one of the new breed of Hawks that Alastair Clarkson will be guiding as he enters the new phase of his illustrious coaching career. This section was reserved for reigning Brownlow Medal champion Tom Mitchell, who averaged a freakish 129.1 Supercoach points per game in season 2018, but after a broken leg in January, you will have to find another option for your opening midfield slot. Instead, when considering Hawthorn players in your fantasy squad, have a think about Ben McEvoy for your second ruck slot. With Brodie Grundy and Max Gawn set to cost you almost $1.5 million alone, there is merit in the strategy of selecting one of those gun ruckmen and then going with a slightly cheaper but still highly dependable option. McEvoy fits into that category, having averaged 101.9 points per game in 2018. Going down this path allows you to spend more of your cap in other positions on the field. Hawthorn president Jeff Kennett didn’t mince his words when the fixture was released, labelling it disrespectful to the club due to the fact the Hawks have been shunned from Thursday night matches and will play just one of their five Friday night games as the home side. Having finished in the top-six bracket, Hawthorn also have some tough double-up encounters, with the club set to face reigning premiers West Coast twice as well as fellow finalists Geelong and the GWS Giants. North Melbourne and the Brisbane Lions, two teams the Hawks failed to beat on three occasions in 2018, are also set to meet Hawthorn in a return bout. As is the norm, the Hawks will play four home matches at University of Tasmania Stadium in Launceston, with Carlton, Port Adelaide, Fremantle and the Lions to be their opponents. Hawthorn will play nine games at the MCG, with six of them home matches, and four games are scheduled under the roof at Marvel Stadium. Bookending the Hawks’ 2019 campaign are tough road trips to Adelaide to play the Crows and Perth to face the Eagles, with games in Brisbane, Sydney and Canberra in between. For just the second time in club history the Hawks will face Carlton in Tasmania, with the match-up set to occur in Round 6, while the Round 3 encounter with the Bulldogs will be the first home-and-away match between the two sides at the MCG since the 2011 season. When the Hawks take on the Giants in 2019 they will be battling at both the MCG, a venue they haven’t played at since 2014, and Manuka Oval in Canberra, somewhere Hawthorn have never played before. The Hawks’ Round 22 clash with the Gold Coast Suns, which is their one and only home game at Marvel Stadium for the year, will be the first time the two clubs have met under the roof. While the Easter Monday blockbuster against Geelong in Round 5 is sure to deliver a crowd of over 85,000, a Friday night encounter with last year’s grand finalist Collingwood in Round 16 will no doubt be a massive event. It will be the Hawks’ only home Friday night match of the season, and with Hawthorn’s dominant recent record over the Magpies (11 wins from their last 12 matches), it looks set to be an absolute must-watch encounter. It’s also worth noting it will be the first time the two clubs have met since Round 1 of last season. Having not experienced victory over the GWS Giants since 2014, supporters will go into Hawthorn’s Round 21 clash with the GWS Giants at Manuka Oval feeling a touch pessimistic. In that time the Hawks have dropped three matches to the Giants with one draw, and given Greater Western Sydney’s excellent record in Canberra, a place Hawthorn have never played before, you would expect Leon Cameron’s men to go in as strong favourites. You can just never count Hawthorn out when it comes to deliberating each club’s premiership chances for the upcoming season. Not many expected them to be a major player in the 2018 season, yet they surprised us all – with the help of a favourable draw – and clinched a top-four position. However, they were exposed as a class below the top three sides of last year, barely giving a whimper in September. The inclusion of Chad Wingard and a fit Tom Scully will boost the class levels, but the loss of Tom Mitchell to a broken leg has all but put a line through Hawthorn’s chances to compete with the likes of West Coast, Collingwood and Richmond given the depth of their respective midfields. The likes of Jaeger O’Meara, Isaac Smith, Liam Shiels and James Worpel will need to lift their games up another level to go close to covering the void left by last year’s Brownlow Medallist. Can Clarko pull a rabbit out of the hat? The Hawks are, for me, one of the most intriguing sides of 2019 as we edge closer to the start of the season. Predicted finish: eighth to 12th.